In this post you will learn how to localize and translate Elegant Themes into various languages. Elegant Themes provides three languages, English, German and Russian, but you can translate your theme into the language of your choice using Poedit software. In this post I’ll explain how to translate Elegant Themes into Spanish, however the process is the same for all languages. Since WordPress 4.1 you can change easily the language of your website from the WordPress dashboard. You don’t need to modify WPLANG in wp-config.php file. All you have to do is go to Settings> General> Site Language, and select your language (o install a new language). WordPress core language files. 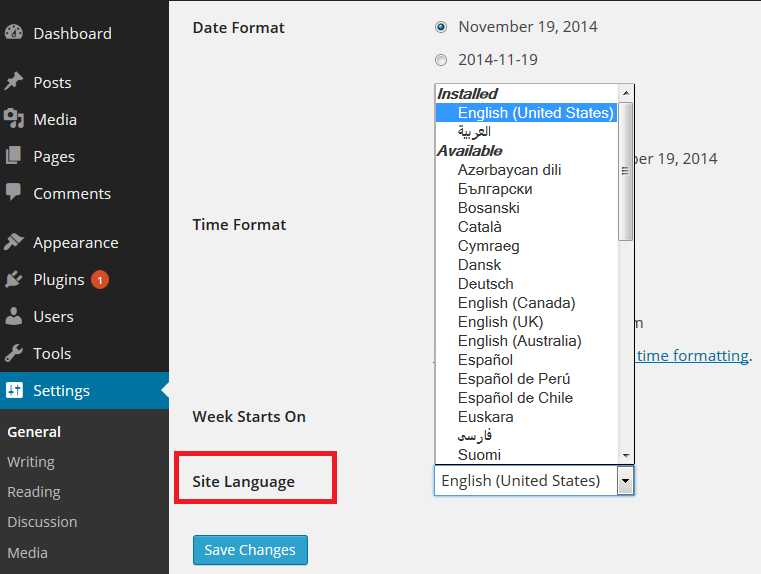 WordPress is presented in English, but you can install it in more than 80 different languages. Elegant Theme language files. 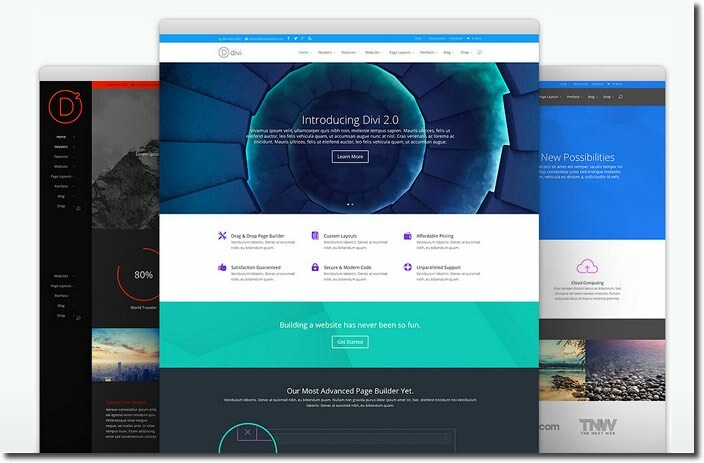 Elegant Themes only provides three languages: English, German and Russian. So if you need to translate your theme to another language, you can do it using po and mo files and Poedit sotware. As I said before, the .po file includes the original texts and the translations of your theme in two columns. It’s a translation that someone else started (a professional translator, the author, etc), and maybe completed. WordPress doesn’t use it. The .MO file includes the exact same contents as PO file. The two files differ in their format. While a PO file is easy for humans to read, MO files are compiled and are easy for computers to read. WordPress gets translations from .MO files. The .MO file is automatically created by Poedit whenever you save a PO file. All you can do with these files is to upload or re-upload them whenever you create or update a .PO file. 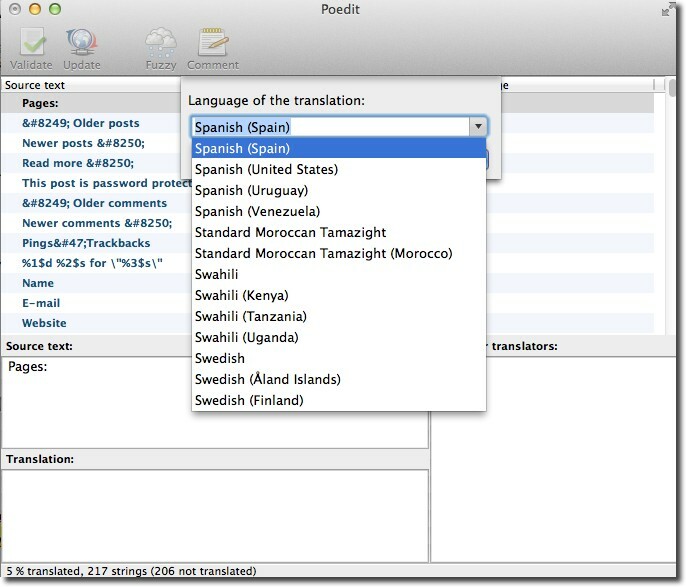 I will show you how to create your own translations using a program called Poedit. Keep in mind that Poedit is a very powerful tool with many options so I am going to cover the basics. Poedit is a software (available for Mac, Windows and Linux) which you can use to translate your theme. It’s available for free on poedit.net. Free version comes with a builtin translation memory that remembers your past translations and uses them to make suggestions for similar texts. Select en_US po file from your theme (you can find the file in the wp-content/themes/divi/lang/ folder). NOTE: You might think that the country code specification can be redundant. But some languages have dialects or variants in different countries. 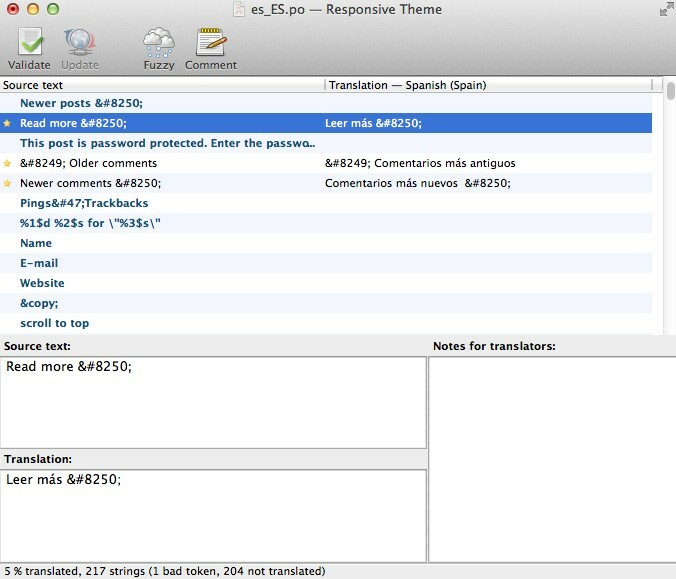 Example: es_MX (Spanish in Mexico). The country code serves to distinguish the variants. 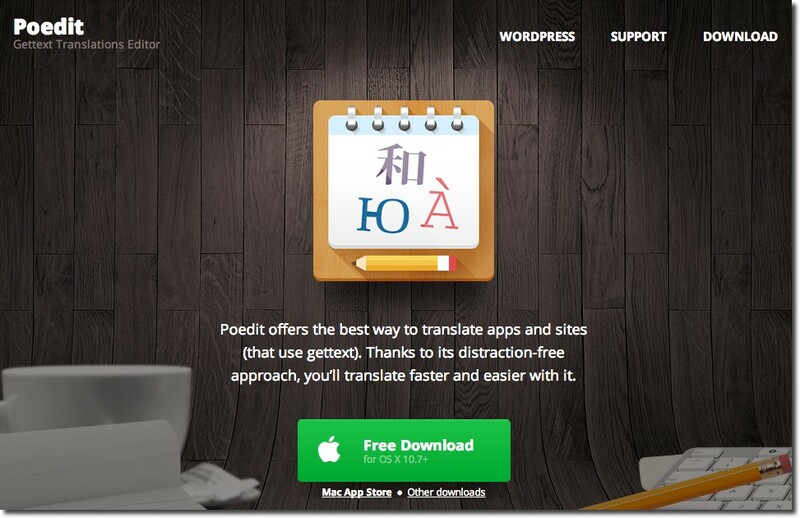 Now you can start translating your theme or your plugin. The space at the top will display all the text ready to translate, and any completed translations will display to the right. The boxes underneath show the source text, your translation and any notes for translators. Translating is really easy – just select a word or phrase, enter your translation and click “Validate”. It´s not necessary translate all text strings. Perhaps you don´t want to translate text strings in the admin theme. When you’ve finished, save your file. Poedit will automatically create both .po and .mo files. You´ll have to upload both to your theme’s languages folder. I use Filezilla to upload the files to my server. FINAL NOTE: You can find Elegant Themes Spanish translations in this link.